Welcome to the home of Ballroom and Latin American dancing in North London. Welcome to the home of Ballroom and Latin American dancing in North London. We teach WALTZ, QUICKSTEP, SLOW FOXTROT, TANGO, VIENNESE WALTZ, RUMBA, CHA CHA CHA, JIVE, SAMBA, AND PASO DOBLE. We cater for absolute beginners with “two left feet” to the experienced dancer. Click on the Group Classes at the top of this page to find a suitable class for you, then on the Class Schedule box to find out what dances we are teaching in that particular level of class this week. PRACTICE SESSIONS to build your confidence. All classes are run on a pay-as-you-go basis PRICE: £8 EACH FOR ONE CLASS OR £10 FOR THE EVENING. PRIVATE LESSONS (£40) are available to speed up the learning process. We hold MONTHLY SATURDAY NIGHT SOCIAL DANCES (£10) to let your hair down and meet up with fellow dancers! Twice yearly I..S.T.D. EXAMINATION DAYS are provided for those pupils wishing to take Medal Awards. VENUE: BISHOP DOUGLASS R.C. HIGH SCHOOL, HAMILTON ROAD, EAST FINCHLEY, LONDON N2 0SQ click here for LOCATION. Huge wooden, sprung dance floor with approx 7,800 square feet of dancing space. FREE PARKING for 200 cars directly outside the hall. We are a dedicated, experienced team of teachers who have patience and enthusiasm in abundance!! So enjoy browsing the website and give us a call or drop-in, you can start anytime, WITH OR WITHOUT A PARTNER. Children’s / Teenager’s classes. 6 – 10 year olds. If you are interested in purchasing lessons as a present, or are just starting out please get in touch using our contact page as there are vouchers available. If you need to use public transport to get to us there are several ways, please click on the map below to find your route! 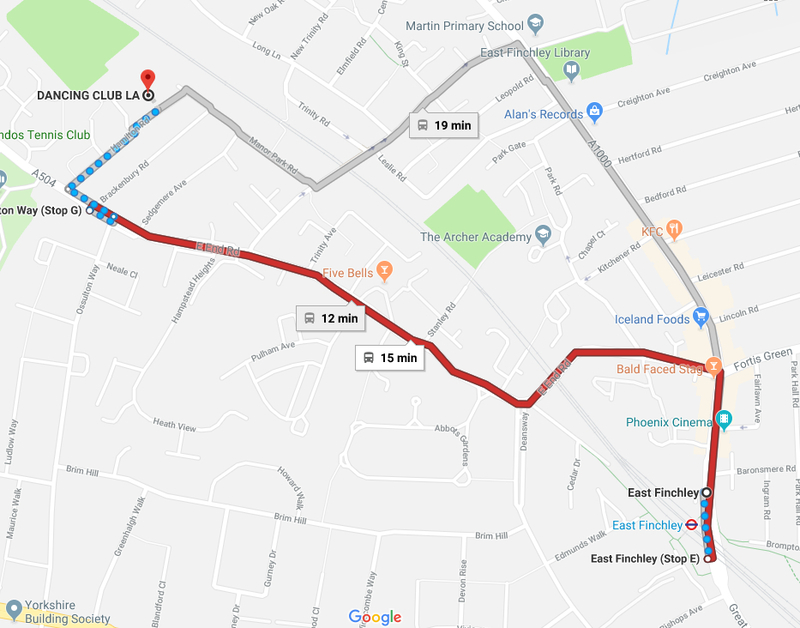 The best way to reach us is by using the 143 from East Finchley Station running every 12 minutes.